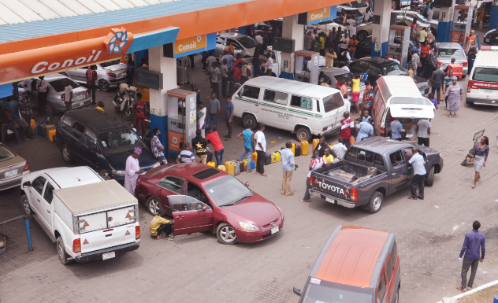 Filling stations in some parts of Lagos experienced queues on Friday amid a supply hitch that slowed down the distribution of the Premium Motor Spirit (petrol) to parts of the country. It was learnt on Friday that the hitch was resolved on Thursday, with more vessels expected to arrive in Apapa and discharge the product over the weekend. Nigerian National Petroleum Corporation restated its commitment to the sustenance of the seamless supply and distribution of petroleum products across the country. The NNPC on Friday appealed to Nigerians to disregard trending social media report of an impending fuel scarcity due to purported refusal by some oil marketers to lift products from depots. The Chief Executive Officer, Clement Isong, in a telephone interview with The Punch, said the hitch led to the loss of a couple of hours in the transition of products between a vessel and the stations. According to him, major markets have products in their tanks in Apapa and are loading. He said 23 depots in Lagos, 7 in Port Harcourt, 11 in Warri, 6 in Calabar and 8 in Kaduna, were stocked with petrol.